This set of Russian Matryoshka Nesting Dolls features one of the most beautiful and incomparable seasons. If you ask anybody what season is associated with Russia then he’ll more likely answer winter. And that is no wonder, since Russian winter is really very bleak and at the same time very mind-bending. World-famous Russian artist has handily depicted fantastic Russian winter on Russian Matryoshka Nesting Dolls with the help of water colors and gouache. The Matryoshka Nesting Dolls “Winter Entertainments” set was designed and hand-painted and personally selected from the artists that we have worked with for many years. These Russian Matryoshka Nesting Dolls depict Russian people at fun and frolic. Winter for children and young people is always like a holiday. You can see that teens on Russian Matryoshka Nesting Dolls are very happy and joyful, because winter gives them an opportunity to play in snow. On each Russian Matryoshka Nesting Doll you can notice a snegovik - funny snowman drawn. Russian people are fond of making snowmen. On these Matryoshka Nesting Dolls traditional snegovik is drawn - a carrot for its nose, and vedro (Russian bucket) for its hat. Sledge driving, featured on Russian Matryoshka Nesting Dolls is a traditional Russian entertainment. In the past sledges were used as a kind of transport in Russia. Now it is very popular to ride on sledges from hills. By the closer look at Russian Matryoshka Nesting Dolls, you can notice that people on sledges are drawn smiling, because it is really gorgeous to drive from the hill at high speed! On these Russian Matryoshka Nesting Dolls the craftsman has painted Russian people in warm variegated clothes – telogrejkas (traditional fur jackets), hats, kerchiefs, fur gloves and valenki (traditional Russian winter footwear, essentially felt boots). Night-time is featured on Russian Matryoshka Nesting Dolls with the help of mixing dark blue and deep colors on the background. It gets dark quiet early in Russia in winter. But children and young people with pink blush on their cheeks don’t mind it because having winter entertainments is really fascinating thing. On the upper part of each Russian Matryoshka Nesting Doll you can see a beautiful Russian girl symbolizing Russian beauty and beauty of winter. The girl is dressed traditionally in bright scarlet kerchief with golden ornament that reminds us of frost draws on window glass. Take a piece of happiness with you! 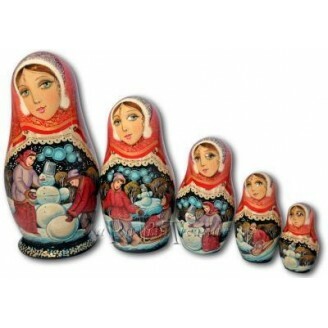 The Russian Matryoshka Nesting Dolls will decorate any place and bring joyfulness and good mood to its owners. It is also rather funny Christmas gift for your friends!